The BMW M3 GTS is the fastest M3 ever with a spicier 450 hp V8, factory roll cage, functional aerodynamic upgrades, and retina-searing paint job. At $170,000 it's the ultimate ultimate driving machine. Here's everything you need to know. One hundred seventy grand is a lot of scratch for any car, let alone a tarted up version of regular car that can be had for a third the price. So what's the secret sauce that makes the M3 GTS worth it? 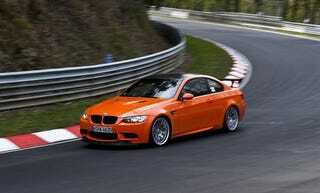 Part of it's rarity, but the major enticement is all the special parts that go into building an M3 GTS. Start with a basic M3 and remove the rear seats and trim, replace them with carpet and a bolt-in roll cage, six point racing harnesses, and racing bucket seats. In the engine bay you'll find the standard 4.0 liter V8 has been massaged to 450 HP and 324 lb-ft of torque, up 36 HP and 29 lb-ft. It's attached to a race-bred seven-speed dual clutch automatic controlled by wheel-mounted paddle shifters. The unique wheels hide six-piston calipers up front squeezing 14.9 inch rotors and four-piston clamps at the rear. Carbon-fiber is the material of choice for the front and rear spoiler which aren't just for show, these are for actual down force. The overall curb weight is reduced from 3,726 lbs to 3,373 lbs which contributes to a scorching 0-62 MPH time of 4.4 seconds, roughly a half second quicker than the standard car. Whether it's worth $170K depends on how much change you've got lying around, but it does serve to remind us Munich can turn out something other than tubby crossovers and bizarre psuedo-station wagons.